Mirror mirror on the wall, what holographic black is the badassest of all? Oh, that's right. It's this one. I have a softspot for black polishes, and an even softer one for unique blacks. This one from Baroness X checks both of those boxes...and then some. 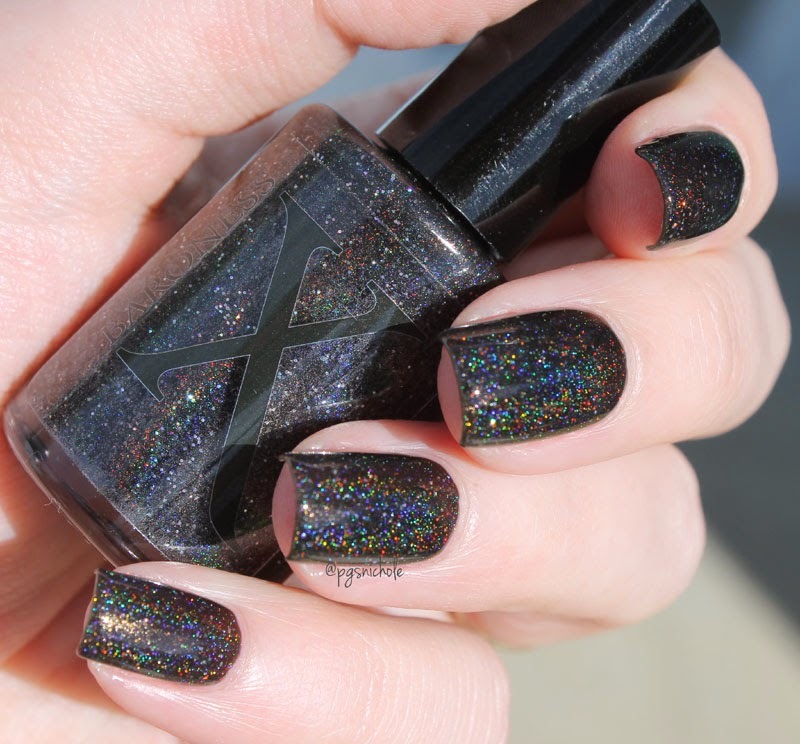 Mirror, Mirror is a super-black jelly-ish polish that is packed with the shinies. There is spectraflair pigment, there is holographic glitter, there might be some ground-up unicorn horn in there. Tl;dr its shiny. It never quite looks the same each time you look at it. The rainbow is strong in the sunshine. So much so that the otherwise upfront holo glitters almost resemble simple silver flakes at certain angles. I love it. I want it in a thousand colors. I like to wear black polish on my toes in the summer time, and I think this might be my Summer 2015 color. And because I can (now), I had some macro fun. I definitely need more practice with that lens. Figuring out the distance, lighting, etc is going to a challenge. It certainly would be easier with a phone attachment I think. But I shall persevere. For Science! Just one more, before we part. Out of curiosity (and partially because I still didn't trust this polish's smooth finish. 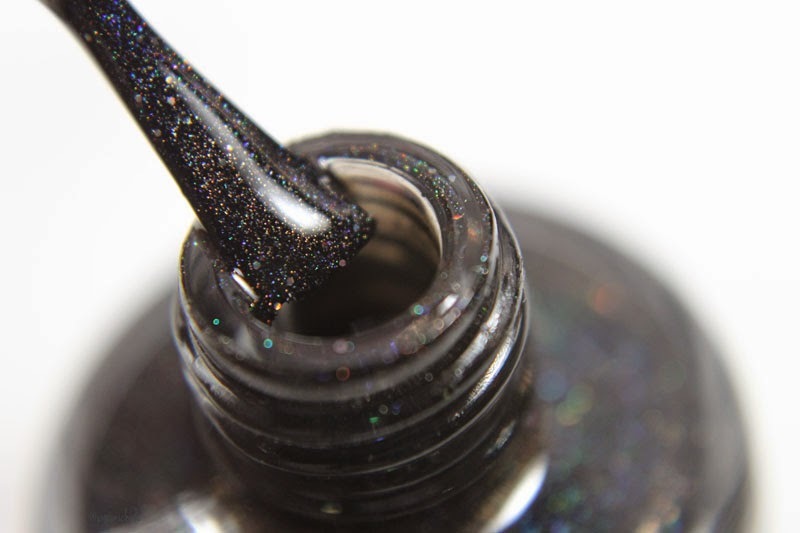 There is no better way to see pitting glitter than to add a matte coat) I added a layer of the WnW matte topper. 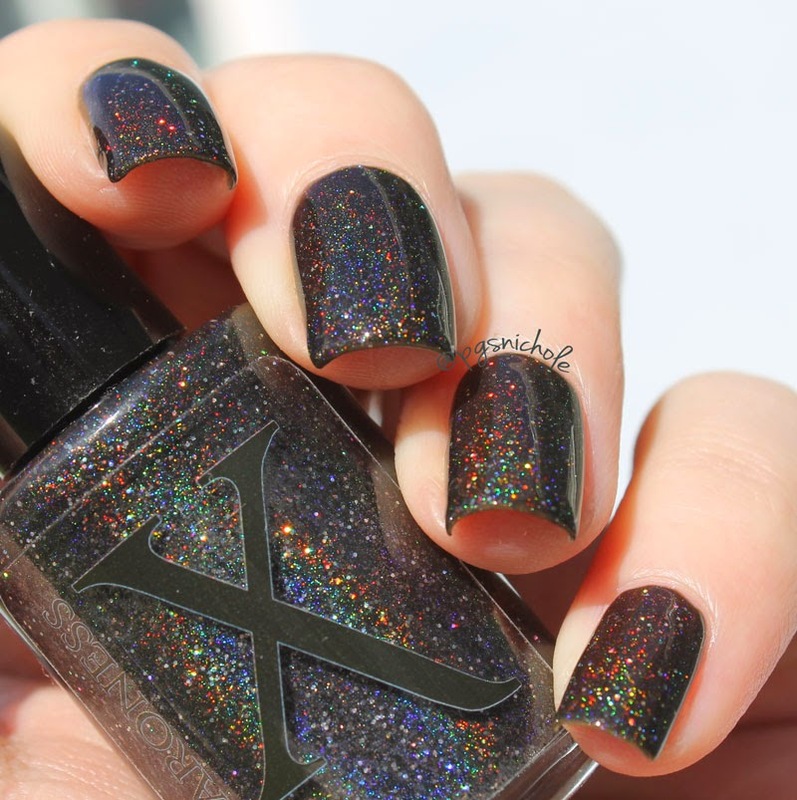 It muted a lot of the shine, but brought out the holo glitters and gave it a look of sparkly leather. I went to Sally's while wearing it, and the clerk asked me about it. It's wonderful. So yeah, scamper on over to Baroness X and grab this one. You need it. How are you living without these shinies in your life?